Being a core element of our university, we always strive to optimally support your studies with our services. Anhalt University Library is a scientific, public library that provides literature and information to university members as well as interested citzen. In order To borrow media, we have to ask you to register and agree to our rules and regulations. To register, please bring your University ID or your personal ID or passport. Books and other physical media is available for loan as long as not marked otherwise. You'll find most of the media grouped according to thematic classification and signature in the freehand areas of the libraries. More about the location and the availability can be found in our OPAC. Magazine stock such as theses, journal-archives and media classified as "SR" have to be ordered. Please ask your librarian. If you need media that has been lent already, you can reserve it within our Online-Catalogue or via our APP (Playstore & iTunes). You'll be asked to log in with your library number and password. Once a medium is reserved it can`t be renewed by the owner. We'll inform you as soon as the medium is available. If you need immediate access to the medium, please check, if there is a reference copy to work with at the library. With Android, your account will be automatically updated. With iOS you can adjust your settings and define whether the account is updated automatically (our recommendation) or only manually by pushing the update button (default). Android sends "push-messages" shortly before the loan period expires. You can activate and define the period of your preliminary reminders within your account-settings. For iOS, you have to add your reminder appointments to your calendar. This requires that the app is connected to your calendar within your settings - the calendar named "Library" has to be activated. Media can be lent for 28 days and the lending can be renewed online up to seven times, unless somebody reserves it. Journals and books marked as reference collection are not for loan. The dunning level increases after 14 days. You can manage your lendings, reserve and renew online via your libarary account or our library APP. Please log in with your library number (starting 3329xxxxxxxx) and - preset - the first three letters of you last name. • there is a pre-existing reservation for your item. 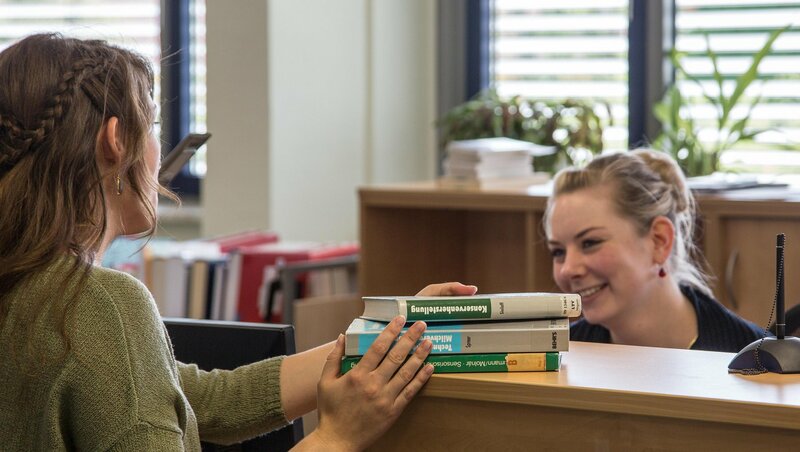 As a user of the Anhalt University Library you are entitled to participate the inter library loan of our common library network. Please ask your librarian. To access our digital services outside the campus network you may authenticate for the campusnetwork via your browser settings. Please follow the instructions. You are invited to attend a guided tour to introduce you to our libraries, our stock and services. Please make an appointment! Our Library-App enables you to search within our catalogue, to reserve and renew liteature and have yourself reminded of deadlines by your mobile deivice. Please visit your App- or Play-Store and search for "Bibliothek Hochschule Anhalt"! Android updates your account automatically. Using iOS you can choose within the settings whether your account is updated automatically (our recommendation) or manually (default). With Android, you can activate preliminary reminders within your account-settings and define the reminded period. For iOS the reminder appointments will be added to your calendar. This requires that the app is connected to your calendar, which has to be enabled within your settings - the calendar named "Library" has to be activated. All our libraries provide WiFi, computers, copying machines, scanner and self-service devices to borrow or return media. To benefit of all of your library's services please have your student card activated as a user card. You can send us a filled out registration form along wih a copy of your student ID by e-mail. As a distance student you can pre-order literature at your library and pick it up, while you are here. Please use our contact form or contact us by phone or email. For your distance learning, external access to our digital resources will be a valuable research tool. Most of the digital resources that we provide is accessible for you after a small browser configuration and authentication with your student-data. For your exmatriculation you will need to visit the library with the exmatriculation form and have us confirm that your account is cleared from loans as well as fees. In case you will stay in our region it is up to you to continue to use our libraries as an individual user after your studies.